Located just to the right of Cala Galdanda. A short boat ride brings us to the dive site at Cala Macarella. We descend to a sandy bottom at 8mts surrounded by posidonia and begin to explore the rocky coast before entering into a small cave that opens up into a larger cavern which leads to another exit. Easy dive. Torch recommended. Picturesque bay on the north side of the island. We dive on the west coast of the bay. Start with a giant stride entry of the quay side, short swim and then descent, where we find 2 caves and lots of amphora. Plenty of marine life. Bay next to Cap de Cavallerie, located on the north coast in the marine reserve. A shore dive, gently entry into the bay at 6 mts where we can see amphora, a roman anchor and a little further around a sunken yacht at 14 -16 mts. Generally good to see lots of marine life. Located on the west coast of Menorca this bay is situated next to Ciutadella and is very popular with all centres on the island. There is the possibility to make 2 dives at this dive site, the left and right hand side of the ramp entrance.. After descending at the right side a short swim brings you to a large rock, which due to its shape is called the “SUBMARINE”. Lots of amphora and a channel swim through at the max depth. To the left side there are lots of pretty swim through’s and an abundance of marine life. A light house located on the south west coast of Menorca, offers a very good dive. A small hike down the rock side brings us to the dive entrance. There are 2 caves to visit here and nice stretches of the sand patches to explore for amphora between the rocks and boulders scattered around. Dive located on the South Coast, between Macarella and Cala Turqueta,. We start dive descending onto a sand patch surrounded by posidonia then following the coast to a rock pinnacle in the shape of a large turtle. The best way to make this dive is to drift. We can usually encounter a very large group of barracuda living here. The Malakoff was a 7000 tonne cargo vessel that sank on 2nd January 1929. 113 mts in length and 15 mts wide she now lies between 38mts at the bow and 40mts at the stern. The minimum depth is 32m. During a terrible storm the Captain and crew thought they were heading north after becoming confused with the lighthouse and the tower on the south coast, they hit the small island outcrop of ESCULL DE GOVERNADOR and sank. The cargo was steel, glass, tiles and cement. The cement on contact with the water has solidified and has created an incredible reef full of marine life. The wreck has broken up a lot but the abundance of life that dwells here is amazing. This site is for specially trained divers only due to the depth and there is some prerequisites you´ll need. A small rocky island to the south of Punta des Pina. Between the shore and the island the depth is 8mts and on the seaward side there is a breath taking wall down to a rock and sea grass plateau at 18mts. The seaward side has the formation of the Easter Island sculptures and is an amazing sight. This is the rock formation that the MALAKOFF hit before she sank. Lots of grouper, scorpion fish and barracuda here. A rock and sea grass gradient from the sea level to 20mts which is the start of the dive. Moving south you arrive to the most southerly tip of Cala en Turqueta and you return north to the shallows via a different route, this is a simple site which is ideal for training dives. Between Cala en Turqueta and Cala Macarella, a horse shoe wall with 20mts on the east side and 10mts on the west. The main attraction to this site is the large cavernous tunnel with the entrance at 10mts, we go in 30mts before coming to the end and finding a vertical chimney that takes you to the exit at the top of the wall named Cova de Na Gall at 3mts which then exits to the sea. Good interesting dive site. Torch recommended. Cavern dive located on the south east coast. One entrance into this huge cavern full of stalagmites and stalactites, very easy dive Torch recommended. A submerged canyon that lies 1.75 nautical miles from Cala Galdana and continues to the south. This site is deep with the bottom of the canyon nearest to the coast at 35mts and it drops away more and more as you head further south. At the base you will find lots of cracks and cavities which are a refuge for many marine creatures and a mystery anchor which normally has large scorpion fish as its residents. This dive is great for all levels of divers. Following the wall you arrive at 10mts to a tunnel entrance. The tunnel is 45mts long and branches two ways, each ending in air cavities. After exiting the tunnels you can carry along the wall which is pitted with holes and crevices full of life. The underwater vista of this site is of lots of rock swim through’s. We dive east to the cave entrance of Cova del Francés which is actually two interconnected caves. Stalactites and stalagmites are seen in both caves and in spring, mating stingrays can be found in large numbers on the sandy bottom outside the caves. A very large cave and tunnel system, the longest being around 300m long. The main entrance is at 8mts and the tunnels are separated into rooms and caverns, the first being 2mts deep and the second is named the ‘bat cave’ due to bats flying around the stalactites in the airspace above! The wreck of this large Dutch river barge, 23mts long and 5mts wide lies 1250mts from the beach of Son Bou in 27mts of water and sits upright amongst sand and sea grass. She was sunk by the Spanish coastguard after sitting in Mahon port for several years, after being abandoned by her owners. The wreck is in good condition and can be easily seen from the surface. She is covered in marine life including fish and soft corals which make this an interesting dive. Dive site situated on the north coast. This dive is aptly named due to the many holes and entrances of the cave, which all lead to the same chamber at 24mts. The dive can be split at 12mts for junior divers. A small walk to the seas edge is where we enter and exit for the dive. Lots of marine life here, scorpion and grouper fish, moray eels and sting rays, crabs and lobsters too. Torch recommended. 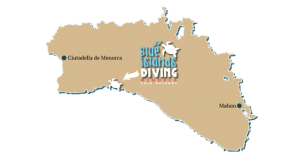 The most famous and one of the most beautiful cave dives in Menorca. 200mts into the cliff ending at a sandy beach with an air chamber always above. Lots of stalagmites and stalactites forming spectacular formations, great opportunity for photography. Torch recommended. The barge platform that was used to build the harbour at Ciutadella, now sunk to form a deep dive. It sits on the seabed and the various compartments can be entered. Easy deep training dive location. Groupers are easily found and the occasional spot dogfish or sunfish.